You have mastered the exotic LARP weapons of Asia and now it is time for you to create your own sword, one that will be not only a deadly weapon but an extension of yourself. You can do this with the DIY LARP Jian Handle - Painted. 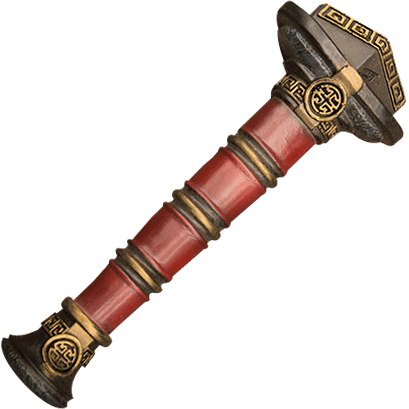 This oriental sword handle is made from a cast polyurethane foam and has been hand painted with incredible details. Golden fixtures decorated with Chinese knotwork circles mix with a red hilt to emulate the opulence that is associated with Chinese aesthetics. Its durable construction is completely safe to use in LARPing events and has been approved by the top LARPing organizations. It also requires virtually no maintenance and will last longer than regular foam latex handles. Begin your DIY project by choosing this pre-painted Jian handle!